Sorry for the delay. I’m starting to make the graphs. Then there will be a few days where I make sure I like it and make minor tweaks. Then it will go online. This will be my last major update. Ever. 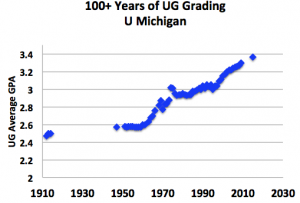 That doesn’t mean that grade inflation has ended. Far from it. I’ll write one more research paper on the topic and I’ll be done. It’s been kind of fun being America’s Grade Inflation Czar and I’m proud of the work Chris and I have done. But I have a finite amount of time on this planet and I have a long list of stuff I want to do. OK, I won’t say never about a future update. If I’m 99 years old, have a working brain, and have done everything else on my long list, I promise to do another update. For those desperate for new data (there are, I know, a few of you out there), here’s a graph of 100+ years of grades at one school. It won’t be posted on the website. Consider it a teaser. Enjoy!